How Many Hackers Does It Take To Change an Electric Rose? 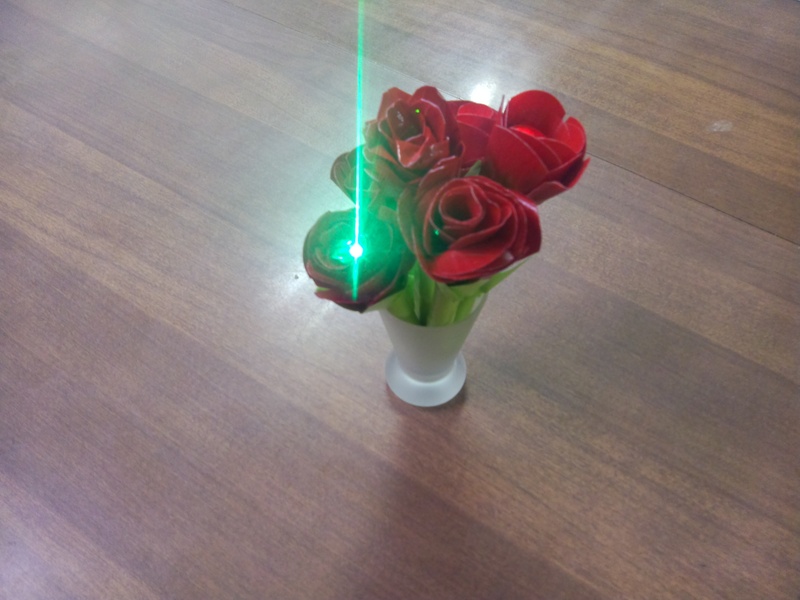 Somewhere in the depths of downtown Glen Ellyn, hackers and crafters alike have come out of the woodwork to conquer Rachel Hellenga’s latest project: creating LED roses out of duct tape. Rachel is developing a kit for her website, Conducti.com, to help people combine technology and crafts. She requested beta-testers and lucky volunteers Rudy Ristich, Mike Emerick, and me were peeled away from their projects to tap into their crafty sides. 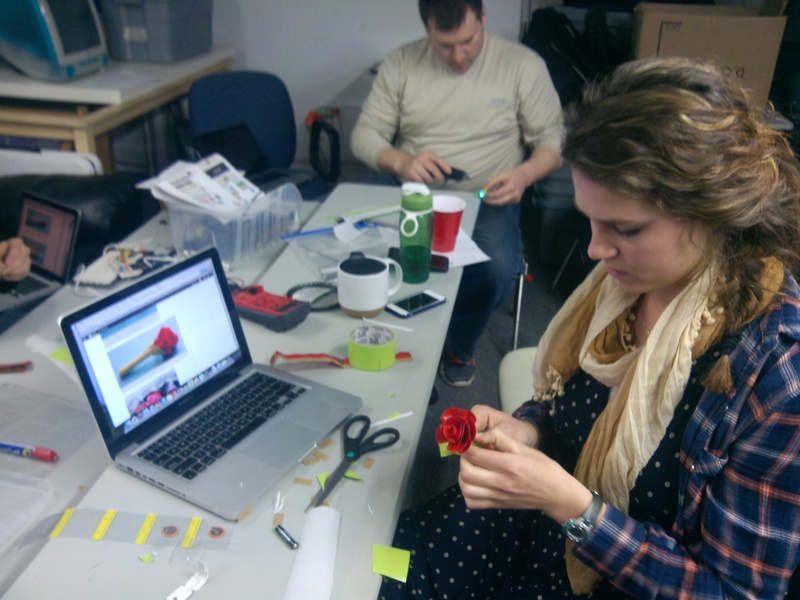 Girl Scout Leaders and educators alike have been clamoring for Rachel’s electric rose how-to guide, so the pressure was on for us to come up with fast solutions to any problems which would arise from her guide. We followed Rachel’s step by step tutorial for the rose-creation from her blog post for Makezine to ensure all directions were coherent and effective. Throughout the process, several problems arose for our two all star techies, who quickly solved the problems by applying creative solutions. I suffered from a few misreadings and ill-placed conductive tape pieces. One difficulty arose from keeping the two AAA batteries (which were connected with a tightly rolled piece of paper) together to maintain a strong connection. 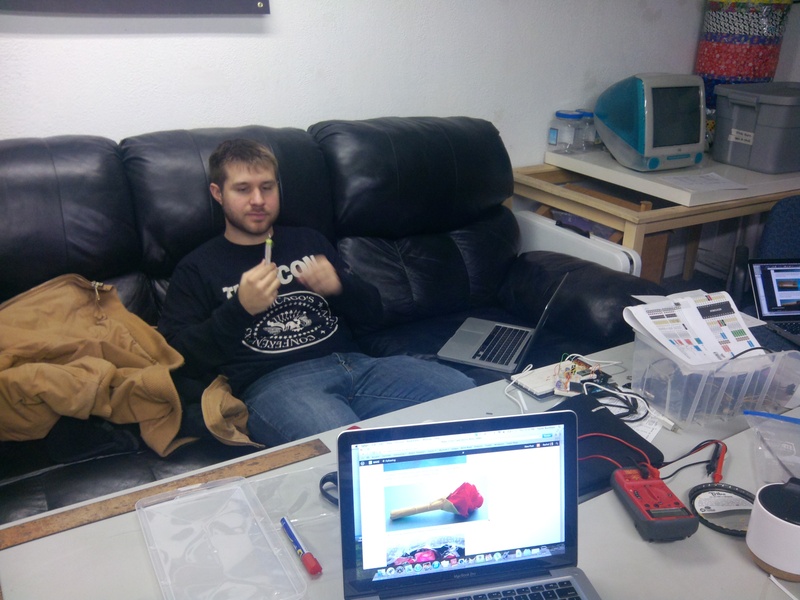 Rudy used his tech-pertise to offer an ingenious solution through the use of rubber bands and duct tape. The use of duct tape provided a new learning opportunity; the tables were turned as I was able to contribute to troubleshooting by assisting my hacker friends in the art of duct tape application which I had gleaned from my many years of experience in paper crafts. In the end, we all finished with fabulous electric roses and were able to help Rachel make necessary changes to her tutorial before it’s published in a kit. This entry was posted in Uncategorized by Taylor Burnham. Bookmark the permalink.